Star City is delighted to welcome Bistro 80 to its restaurant lineup. Bistro 80, named after the Star City address at 80 Pyrmont Street, resides in the space once occupied by Sean’s Kitchen and will feature bistro favourites stretching from classically cooked steaks and fish with a number of side dishes to fresh and simply prepared seafood. Heading the kitchen brigade is Paul Gaspa, fresh from a stint at Crown Melbourne via many of the world’s great restaurants, including the Lanesborough in London, the Michelin-starred Conrad Hotel in Tokyo and the Al Mahara Restaurant at the iconic Burj Al Arab Hotel in Dubai. The popular beer, Carlton Draught, is taking an Aussie pub tradition to a whole new level. Launched today, the Carlton Draught Massive Meat Wheel promotion gives Aussies the chance to go for a spin on the world’s tallest cantilevered observation wheel, the EDF Energy London Eye, competing to win $100,000 and a meat tray. To celebrate this amazing feat, Carlton Draught has commissioned Jac Wagyu, one of Australia’s premium Wagyu Beef farms, to help them create the world’s greatest ever meat tray. Essentially made from beer, the tray will feature specially developed Wagyu beef, reared on the quality hops and malted barley used to brew Carlton Draught to deliver a unique flavour profile. The result of the program is a gourmet twist on a classic Australian pub tradition of raffles and meat trays, replacing the old style trays, with their fatty sausages and cheap chops, with what could be the world’s finest beef. To produce the limited edition Carlton Draught Wagyu Beef, the brand has enlisted Australian farmer and Jac Wagyu owner, Jason Lewis, to rear twenty head of cattle on a special feeding program, providing the herd with ten tonnes of malted barley and two tonnes of natural hops. Coogee Cafe… After Dark, Food, Wine & Beer at its best! After an extensive refurbishment Coogee Cafe will reopen its doors to the public on November the 17th giving Coogee a hip dark hangout to call its very own. 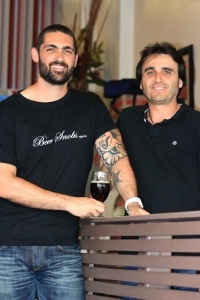 Dan Hampton, local restaurant manager and director of Beer Snobs, an Aussie Boutique Beer Appreciation company, has joined forces with owner of Coogee Cafe, Con Zarocostas to bring Coogee locals its first small food, wine and beer hangout for those who enjoy simple food while drinking and supporting quality, boutique beer and wine. Serving over 20 Australian Craft Beers and Boutique Wines accompanied by a simple yet delicious menu. Coogee Cafe, After Dark will open its doors every Wednesday to Sunday from 6pm until late, whilst keeping its regular day time trade of 7am – 5pm daily. “Coogee Café is definitely one of the most popular cafes on Coogee Bay Road, but the street lacks a chilled place to eat and drink at night, without having to go to one of the big pubs or restaurants”, says Hampton. This is where Coogee Cafe…After Dark comes in. “We want it to be a place where friends and couples looking for a cool atmosphere can hangout, without having to dodge pool cues or brave the busy pub queues” Hampton said. Not only will Coogee Cafe…After Dark serve quality, local beer and wine along with a simple, local and fresh menu it will also have themed music nights including Jazz and Blues Thursdays, Funky Fridays, and Chillout Sundays. “We are so excited to finally provide something new and different to Coogee nightlife” says Hampton. More information and updates on Coogee Cafe… After Dark can be found on twitter @CC_afterdark or here. ivy’s Pool Club will be making the most of the impending heat of the summer as it re-opens for the season– now with an extended lunch menu for those seeking an oasis in the city on their lunch break. City workers rarely take the time out to rest, relax and reflect, balancing ever busy work lives with the pressures of family and trying to squeeze in some fun with friends. So high above the ceaseless traffic of George Street, crowds of Martin Place and 24:7 atmosphere that is Sydney’s CBD – Pool Club is screened off from the world and opened to the sky above and offers a one-of-a-kind getaway for those seeking day time serenity and to regain their sanity. The new lunch menu extends on the already popular pizzas and paninis to include salads and antipasti for those who like to pick. A lunch special is available for $15 which includes your choice of pizza, panini or salad with either a Peroni, glass of wine or soft drink. As the sun sets another vibe takes over and revellers looking to escape the heat can keep cool in poolside cabanas whilst sipping cocktails designed by head mixologist, Mikey Enright. ivy, 320-330 George St, Sydney. Australia’s favourite apple grower, Batlow Apples, has teamed up with Coombes Bros to form the newly established Batlow Brewing Company. 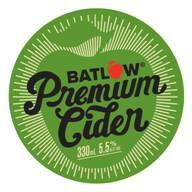 The company has been formed to produce its inaugural product, Batlow Premium Cider, handcrafted from a carefully selected blend of the best quality Australian-grown apples. The apples are grown, picked and pressed in small batches in Batlow, NSW, and shortly after transported to the cidery, where they are fermented under strictly monitored conditions. This production process ensures one of the freshest, crispest ciders on the market and unlike many commercial ciders, Batlow Premium Cider uses fresh crushed, locally grown apples, contains no concentrates or added sugars and is gluten free, making it one of the healthiest ciders on the market. Batlow Premium Cider has a golden straw appearance with fine bubbles provided by natural carbonation. The cider’s aroma is fresh, fragrant apples with a touch of earthiness. The taste gives a mild, refreshing sweetness followed by a light grip on the back palate and a clean medium dry finish, resulting in a well-balanced, fresh tasting cider. It has an alcohol level of 5.5% and will be available in 330ml bottles in 4 packs and cartons of 24 bottles from December 2010. Looking for an after work haunt to wash away the workday? 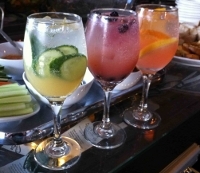 Why not stop into Pocket and experience The People’s Hour, a reinvention of the famous Italian Aperitvo. Every night from 5pm – 6pm an array of delicious aperitif cocktails will be on offer alongside a variety of complimentary appetisers at the bar. Designed for sultry summer evenings, the selection of aperitifs accompanied by Italian style nibbles will open the palate and tease the taste buds before dinner. “The People’s Hour is for our hardworking people, it’s that little something extra to help the day melt away. Have a cocktail or two, or three and watch the sun go down amongst good company,” said Karl Schlothauer, co-owner of Pocket. Capturing the essence of Northern Italy where Aperitivo hails from, three new Martini cocktails have been created for the menu. Each with a different twist on the great classic cocktail the Spritz, they are guaranteed to take away the pain of the day. A variety of tasting plates will change daily and include favourites such as olives, homemade dips and bread as well as gourmet salads, cheeses and other special Pocket delights to ward off hunger pains but not spoil a good appetite. “In Italy Aperitivo has become a traditional art form; at Pocket we want to make our own art out of it and offer a unique experience that people want to come back for”, said Christophe Lehoux, co-owner of Pocket. The much loved Manly local Audrey Myrden in March this year was delivered the devastating news that she was suffering from Glioblastoma Multiforme (an aggressive brain tumor). Audrey’s case is unfortunately considered terminal and very rare. But despite the odds Audrey is determined to fight it. Afraid of leaving her young boys to grow up without their ‘mummy’ and her husband a widower she has shown an immense amount of courage in her battle. To find out the full details of the families plight, you should read Audrey’s story posted over at her blog on the Audrey’s wish website. I have personally known Audrey for around 9 years and had the pleasure working along side her at the Barking Frog Cafe, in 2001. She is a fantastic lady with a heart of gold, who in this case has unfortunately been dealt a rough hand. To help ease the financial burden on the Myrden family covering medical bills and the upkeep of the young boys a couple of fund raising events are coming up, which need your support! July 30th Golf Day: This may fall on a weekday, but if you love your golf this is a rare opportunity to play the Manly course not to be missed! The fun kicks off at 10am on the green, and is followed by a cocktail reception at 5pm. Tickets are $185 per person for the full day or $75 per person for just the cocktail reception, check out the site for the full details. August 15th Benefit: A fashion parade and cocktail evening at the International College of Management Sydney in Manly. This black tie evening should be great with fashion, entertainment and silent auctions! Tickets are $75 per person, bookings can be made along with the full details of the event over at the Audrey’s Wish site. Donations can also be made at the Audrey’s Wish website, for those that can’t make the events but would like to show their support for this well loved Manly family. Ever been left unattended in a bar full of booze and not been able to decide what to drink? No either have i, but if in some strange parallel universe this scenario was to happen i would have no trouble deciding on a tasty shot to drink with the iShot machine application. After installing the application on an Apple iPhone or iPod touch, simply load it up, shake the device, the reel of the old school style pokie will start spinning and you will be presented with the recipe for a shot to drink. You can then add the selected shot to your favorites list and rate it, the rating is uploaded to a central server for a social drinking 2.0 feel. If you don’t like the random approach to choosing a drink you can always just browse the drinks database, which contains the recipes for over 3,000 shooters. Your search over the database can even further be refined to limit the recipes returned to certain types of spirits to match your tastes and spirit types to hand. At $2.49 AUD this app won’t cost you the earth and if you like drinking shots or the challenge of making them, i think its worth the purchase just for a mobile database of shot recipes. Claims have been made that Channel 9 encouraged participants of its Ladette To Lady reality tv show to partake in binge drinking during the filming of the show. According to a contestant Bianca Stevens channel 9 brought her “goon” and then allegedly took her and a mate out on the town spending another $150 dollars on getting them tanked. Really is this a surprise? Mix semi retarded television wanna bees, with scum bag TV producers and it had a fairly predictable outcome. Of course the contestants are taking no responsibility for getting blind and its all Channel 9’s fault they got in a state. If channel nine knows what is good for them they will see a follow up reality show in this where they take contestants from the shallow end of the gene pool and teach them to take responsibility for their own actions. The Sydney Morning Herald today published a sad story informing us that the Government plans to raise the taxes on all beer wine and spirits to help boost the budget by 3 billion dollars. So if if you think drink prices are steep already expect it to get worse, I myself would prefer they just stopped spending the money they have on crap as opposed to poaching us for more, but as if that’s likely to happen.